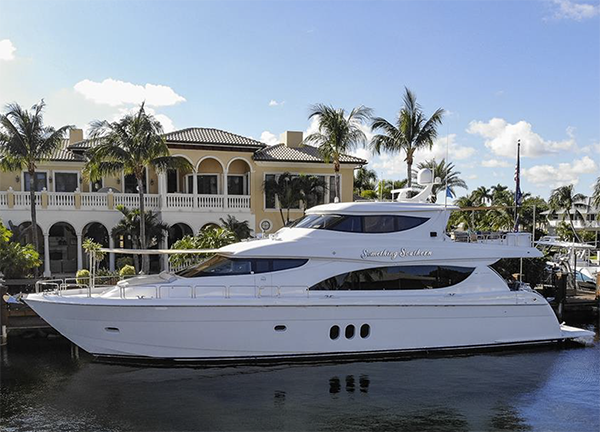 80 Hatteras Motor Yacht for Sale "Something Southern"
"Something Southern" with 4 staterooms, each with ensuite head, like all Hatteras motor yachts of this type really provides 100' yacht space and amenities. Crew and captain's cabins expand the living space, and famous comfort and sea-keeping ability make this beautiful yacht ready to go. "Something Southern"powered by twin Caterpillar C-32A's with only 750 hours, enjoys the latest TRAC zero speed stabilizers for underway and on-anchor comfort. Recent upgrades include a new computer hosting Hatteras' systems monitor, a Wolf induction 4-burner stove top, and a swim platform lift. Custom aft deck tables done in Macassar ebony make for stand-out entertaining and relaxing. "Something Southern" is ready to show and go. Extensive shipyard period completed in the fall/winter of 2017.